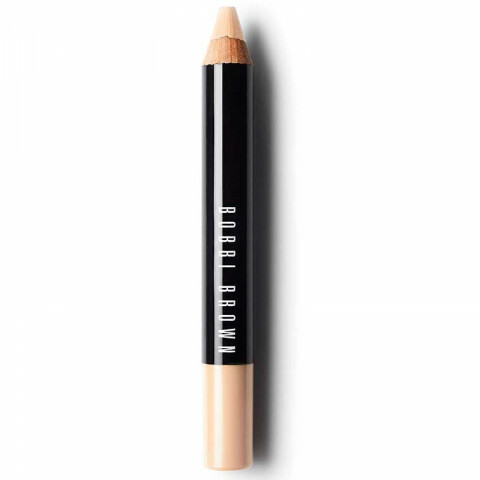 What is it: The secret to a retouched yet natural look, this creamy-matte pencil undetectably lightens shadows, covers dark spots, and neutralizes redness. The collection also includes an Illuminate Pencil that's ideal for all skin tones. Use it for highlighting cheekbones, the inner corners of the eyes, or brow bones-any feature you want to play up. Why it's different: Retouching Face Pencil is designed to look natural on skin-never fake, cakey or masky. The creamy-matte texture glides on comfortably and blends seamlessly into skin with a few pats of your finger. Plus, it's incredibly versatile: use it on bare skin as your all-in-one skin perfector or layer it over foundation for added coverage where you need it. To cover shadows: Choose a pencil one to two shades lighter than your skin tone and apply on recessed parts of the face-inner corners of the eyes, around the nose, and corners of mouth. To cover dark spots: Start with a pencil one to two shades lighter than your skin tone, then layer a pencil that matches your skintone. To cover redness: Choose a pencil that matches your skintone. Apply before or after foundation, wherever you see redness. It can also be used to touch up skin throughout the day.To highlight: Apply the Illuminate Pencil on top of the cheekbones, the inner corners of the eyes, and on brow bones. Blend with fingers. great product to cover imperfections and dark circles. has a semi-matte finish which works great to cover the occasional pimple. I had a lot of difficulty with my concealer disappearing 5 hours into the day. I have a very oily chin and nose and my concealer would vanish, leaving my redness showing. Not with this product! It is simply amazing! It lasts ALL day and I don't get shiny at all. No redness shows through either! A true must have. this is a great retouching pencil product to use on the go. small enough to fit into my bag. great! Love using this all over to cover certain areas. Applies nicely and doesn't cake your face.